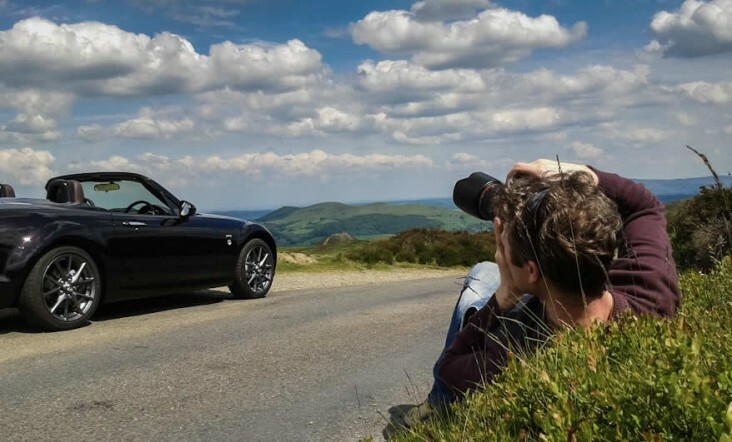 My latest car photography project was shooting the Mazda MX-5 Roadster on location for Convertible Car Magazine. I’ve had the chance to spend a few days with the MX-5 now and it’s a lovely little car. Great fun to drive and rather handsome for a Japanese sports car. The Mazda can easily be overlooked as sports car due to its relatively small and low powered engine but on a windy country road there are few cars more enjoyable to drive. In the real world you can have more fun with this little car than you can in the kind of super-car that will have you breaking speed limits before you’ve even had chance to smile. I first shot it in the midday sun – normally a photography no-no but with limited time and the forecast of rain for several days I had to take what I could get. Worse still the car was a very dark metallic purple colour which looked black at first glance – attractive but a tricky colour to bring out without a studio. Shooting on hill tops and in the depth of the countryside with fill flash and reflectors to brighten up the shady areas, I was quite pleased with the results. Later in the week I took the opportunity to take some detailed shots in more controlled conditions under evening light and studio strobes.